On account of sharing services Dropbox and BitTorrent were recently in news. Many sharing services are quite popular nowadays on account of their sharing properties. 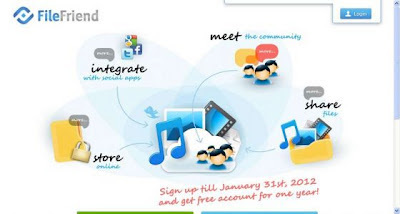 One such sharing service is File Friend that adds social touch to File Sharing. No doubt, Facebook, Google+, Twitter, etc. are nice on sharing files and pictures but for sharing Files there is a massive problem of limited space, nevertheless, the social media sites are even not for the major tasks of file sharing and documentation. On file sharing there is hardly any requirement of install a desktop application it is a browser driven program that provides an extra edge over Dropbox or BitTorrent. With social sharing features into it can be easily add people to share files and videos along with. It has many unique features like unlimited disk storage space, unlimited size of single file uploaded to the service. It is a free service and has an annual charge incase for the yearly membership. Facebook, Twitter, Google+ connect to sign in. Facebook friends can be called upon straight from the FileFriend. Easy copying of friend’s files as they can be “anchored” in their account for further viewing. More it provides an easy and systematic free social sharing among friends. It has Drag & Drop upload feature.